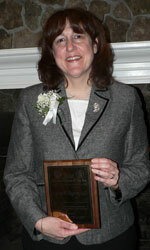 The Chamber of Commerce of Newtown and the Newtown Rotary Club announced the recipients of the Fifth Annual Business of the Year Award ceremony over dinner on March 31, 2008 at the Inn at Newtown. The award has been established as a means of recognition for those businesses in town who contribute considerably to the town community, either by means of donations or volunteerism. Nominations were submitted by members of both the Chamber and the Rotary Club. Finalists and honorees were determined by the award committee which included Peter Giarratano of P & M Consulting, Robert Attanasio of Cartridge World, Pat Linnell of Keller Williams Realty, Brian Amey of Newtown Savings Bank, Mike Snyder of Allstate Insurance, and Alan Clavette of Clavette Josselyn & Co.
Category I represents companies operating with 25 or fewer employees and after citations of the many contributions offered by each of the finalists, the honor was bestowed upon Attorney Anne M. Ragusa, LLC. Anne has been a contributor to Newtown since she opened her private practice in 1994. Her unending community support, integrity, professionalism and zest for volunteerism in the town where she and her family call home is unsurpassed.